Studio One Artist Booster Pack for 30% Off in August 2017! 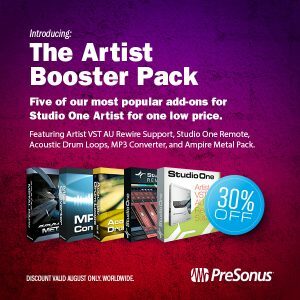 Grab the Studio One Artist Booster Pack for 30% off for the month of August right out of the PreSonus Shop! Studio One Artist is a powerful DAW–the Artist Booster Pack takes it next level. With this bundle you get five of our most popular add-ons for Studio One Artist! Use your third-party plugs in Studio One. Posted in Promo / Discount, Studio One | Comments Off on Studio One Artist Booster Pack for 30% Off in August 2017!